An innovative and sustainable way for production of vanadium is to co-process vanadium titanomagnetite ores with vanadium-bearing slag from steel industry, via reduction, producing a hot metal containing about 2 mass% vanadium, 0.1 mass% phosphorus, and 0.4 mass% silicon. A vanadium-extraction method was developed for these hot metals using a semi-industrial-scale converter. Oxidation was carried out with an air jet enriched to 50 vol% oxygen and by top-charging up to 70 kg iron ore pellets per ton hot metal. 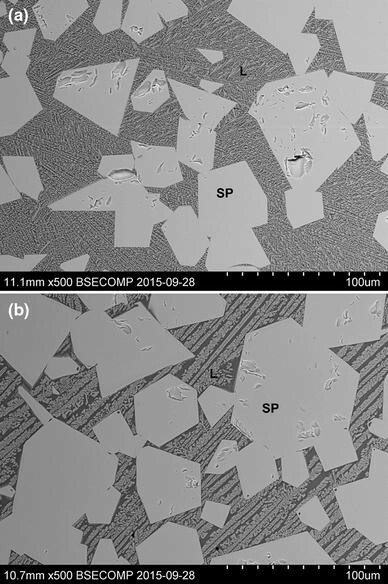 The complete dissolution of pellets was achieved by deliberately creating good stirring conditions utilizing high momentary decarburization rates. The temperature could be controlled to around 1677 K at the blowing endpoint after the pellet coolant had been dissolved. Produced vanadium slags contained as high as 20 mass% V. The semifinished product contained about 3 mass% carbon and 0.1 mass% vanadium, corresponding to a vanadium yield of 94%. The phosphorus distribution to the slag was low when good stirring was maintained. The slag composition had a more significant impact than the temperature on the vanadium distribution. Laboratory-scale study also showed that the temperature impact on the composition of the liquid phase was minor. Vanadium (V) titanomagnetite ores globally constitute the main source for production of V-containing commodities, most importantly vanadium pentoxide (V2O5) and ferrovanadium (FeV) [1, 2]. Several deposits of V titanomagnetite ore are available in the world, and a few of them are located in Scandinavia. Since these iron ores contain relatively high titanium (Ti) content, the feasibility for an economic exploitation is in many cases dependent on the possibility to extract V as co-product to iron (Fe). FeV is produced from vanadium trioxide (V2O3) or V2O5 [1, 2]. Extraction of V as co-product to iron is usually performed by concentrating the V in the hot metal into a V slag. The V slag is then converted to V2O3 or V2O5 by a salt roast and leach process . The formation of V slag usually involves two main pyro-metallurgical steps. At first, the ore concentrate or direct reduced iron (DRI) is reduced to a hot metal with a V content in the range of 0.3–0.5 mass% [1, 2, 3, 4]. In the second step, the V in the hot metal is oxidized at a temperature of 1673 K or below, forming a slag with normally 9–15 mass% V depending on most importantly the hot metal composition [1, 2, 3, 4]. Basically two different unit processes are today applied in the industry for production of V slag from V-rich hot metal, namely, hot metal ladle and basic oxygen furnace (BOF) . These two processes share the same chemical and process principles where chromium (Cr), Fe, manganese (Mn), silicon (Si), Ti, and V are oxidized with oxygen gas. Partly due to the low productivity in the ladle process, the BOF is used by most V producers, called the duplex process. In the duplex process, the V in the hot metal is blown to the slag in a first converter producing a carbon-bearing semifinished product [1, 3, 4]. The residual V content has been reported to be between 0.03 mass% and 0.06 mass% corresponding to a V yield of about 85% . The semifinished product with about 3 mass% C is converted to steel in a second converter with the addition of the necessary amount of slag-forming materials to ensure that the steel has a low content of harmful impurities. It should be mentioned that the V content in the hot metal produced in the former Highveld steel plant was on a superior high level of up to 1.5 mass% [1, 2, 5]. The V was extracted from the hot metal by mechanical stirring/agitation and oxygen-blowing in a so-called shaking ladle. The tap-to-tap time was between 75 and 110 min. The V yield was reported to between 90 and 92% with a residual V content in the hot metal of 0.09 mass% . The oxygen blowing time for V in the duplex process is about 5 min, which shows the superior productivity of the BOF over all other known processes [1, 6]. An innovative and sustainable way for production of V, which is proposed here, is to co-process V-bearing titanomagnetite ores with V-rich steel slag (BOF slag). Some BOF slags in Europe, in particular in Scandinavia, contain 2–3 mass% as V. The content of V and Cr limits the external use of the slag. In many cases, the slags are disposed. In a previous study, a titanomagnetite ore concentrate from the Mustavaara deposit in Northern Finland containing about 0.8 mass% V was co-processed with up to 200 kg V-bearing BOF slag with around 2 mass% V per ton concentrate . 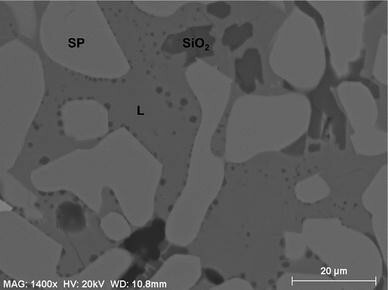 In addition to V, iron (Fe) is recovered, and the CaO, MgO, and SiO2 components in the BOF slag, needed to flux and dilute the TiO2 content in the slag, are reused. The produced hot metal was composed of about 2 mass% V, 0.1 mass% phosphorus (P), 0.4 mass% Si, and 0.3 mass% Mn. Note that processing of solely V-bearing BOF slag has also been proposed to produce a hot metal with 10 mass% V and 1 mass% P . The V slags to be produced from these hot metals with high V content in relation to Cr, Mn, Si, and Ti can therefore be expected to have V contents greater than 15 mass%. In a previous study, the phase relationship in FeO–SiO2-based slag with V fixed at 20.4 mass% was investigated experimentally at 1673 K . The compositions covered the normal production range of V slag, viz., Al2O3 from 0 to 6 mass%, CaO from 1 to 5 mass%, and SiO2 from 10 to 17 mass%, with MnO fixed at 5.5 mass%. The V slags were found to be solid–liquid mixtures, either in a two-phase region consisting of a liquid and a solid spinel phase, or in three-phase region consisting of liquid, spinel phase, and free silica. Spinel and/or karelianite precipitation in V-saturated slags [10, 11, 12, 13, 14, 15] results in a sharp increase of the slag viscosity , which has been reported to have an impact on the extraction efficiency of V . Studies on phase relationships of V slags will render a fundamental foundation toward the development of a V-extraction method from hot metal highly enriched in V.
This study aims at the development of a V-extraction method from hot metal with 2 mass% V and 0.1 mass% P using a semi-industrial-scale BOF. The results is expected to provide important understanding of V-extraction processes based on the use of secondary resources with higher V contents and higher impurity levels, for instance P, compared to primary sources as titanomagnetite ores. A low P content in the V slag is especially important as a significant part will accompany the V into the final alloys [1, 2]. A low P content is requested by the steel industry, which is by far the largest consumer of FeV. In view that the presence of solid spinel has a direct impact on the V-extraction efficiency, the phase relationship in FeO–SiO2-based slag with 20 mass% V at 1573 and 1773 K are also studied. The information of phase relationship obtained along with the results at 1673 K  will provide a better understanding of the effect of temperature on the extraction process. Figure 1 shows an outline of the equipment used for the V-extraction tests from a Fe–V(2 mass%)–P(0.1 mass%) melt. A 6-ton BOF lined with MgO–C refractory was equipped with a water-cooled lance and one bottom tuyere. The water cooled lance with single nozzle was designed for a gas flow rate of 17 m3n/min. Nitrogen was flushed through the bottom tuyere with a flow of about 0.6 m3n/min throughout the whole test in order to improve the mass transfer in the bath. The gas stirring was found necessary to ensure stability of the process. The hot metal which was partly produced in an earlier study  was re-melted in an electric arc furnace (EAF). Between 4970 and 5060 kg of hot metal was then charged into the BOF and sampled. The amount of hot metal in and out was weighted with an overhead crane. Special effort was made to minimize slag entrainment when tapping the EAF and when charging the BOF. The depth of the liquid bath in the BOF was around 580 mm. Oxidation was carried out by blowing an air gas jet through the water cooled lance. The orifice of the lance was kept at a height of about 1600 mm above the bath during the first half of the treatment and at about 1400 mm above the bath during the final period. While in the first two tests air was employed, in the remaining trials oxygen-enriched air with 50 vol% O2 was used. The off-gas composition (A), flow rate (V) and temperature was measured (T). 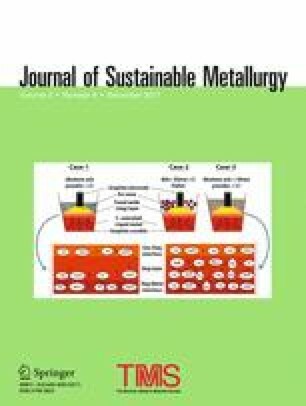 Iron oxide pellets were used as coolant instead of the conventionally used mixture of iron oxides and scrap, due to higher dissolution rate of iron ore pellets  and higher driving force for V oxidation . Iron ore pellets with 67 mass% Fe, equivalent to 0.20 m3n O2/kg pellets, were fed into the melt from an overhead material bin during the first 3 min. No slag additives were charged, meaning that the slag was formed by oxidation of primary Cr, Fe, Mn, Si, Ti, and V in the hot metal, carry-over slag and gangue in the iron ore pellets. Slag sampling was performed once when the treatment had ended. The slag was sampled with a slag spoon and air-cooled on a steel plate. The temperature was measured every 2 min with high performance expendable temperature sensors (Pt–Rh 10 mass%/Pt) from Heraeus Electro-Nite. An immersion lance was used to dip the sensors into the molten metal. Prior to tap, a specially designed slag dam made of steel plates with castable refractory was mounted on the mouth of the BOF. The hot metal was then tapped into a transfer ladle and later beach casted. Thereafter the slag dam was removed. The “slag” was then easily removed by the up ending of the BOF above a slag pot. The amount of top-charged pellets in kg per ton hot metal (kg/tHM), the total supply of O2 through the lance in m3n/tHM, the initial metal composition, temperature and weight of the melt are presented in Table 1. Chemical analyses of metal and slag samples were conducted with X-ray fluorescence spectroscopy. The C and S contents in the hot metal were analyzed by combustion analysis (Leco CS230). Slag samples were prepared for SEM–EDS analysis (Hitachi S-3700 N with a Bruker EDS analyzer) by mounting them into conductive embedding material and polished in ethanol. C coating was made using a JEOL JFC-1300. A detailed description of the equipment and the experimental procedure can be found in previous study . Only a salient feature of the setup is given here to orientate the readers. The suppliers and purities of the powders are listed in Table 2. FeO was prepared from a Fe and Fe2O3 mixture with a total composition of 51 mol% oxygen at 1163 K . While the Al2O3, CaO, and SiO2 powders were kept at 1173 K for 10 h to remove moisture and volatiles, the Fe2O3 and MnO were dried at 378 K for 12 h before use. The samples were then prepared by mixing appropriate ratios of the oxides in an agate mortar and pressed into pellets. The ratios of the mixed powders for the six samples are shown in Table 3. In all samples, the MnO, SiO2 and V2O3 content was targeted to 5.5, 17.0, and 30 mass% (20.4 mass% V), respectively. The slag compositions were balanced with FeO. A vertical resistance furnace, equipped with MoSi2 heating elements and Al2O3 working tube was used (see Fig. 2). In order to quench samples rapidly without withdrawal from the furnace, the working tube was interconnected to a water cooled Al chamber. The pellet was placed in a molybdenum (Mo) crucible. In view of the fact that the slag in the reactor is exposed to different oxygen partial pressures through the thickness of the slag phase, to study the phases of the slag, the slag composition must be maintained. Because of the presence of vanadium oxide in the slag and its multivalence nature at different oxygen potentials, it was necessary to use a closed system for all samples. The closed system would ensure that the sample having different compositions being studied under well-defined equilibrium conditions, with respect to the chemical potentials and temperature. A Mo lid fixed with a weight was placed on the top of each sample crucible. In addition, the sample holder was sealed with a Mo cap. This arrangement would ensure that the slag would not react with the gas phase in the reaction chamber. The sample crucibles were loaded into a Mo sample holder, which in turn was connected to a lifting unit via a steel rod with a Mo extension. A B-type thermocouple was placed less than 10 mm below the sample holder. The reaction chamber was sealed. The system was then evacuated with a vacuum pump and thereafter filled with high purity argon (supplied by Aga Linde, H2O ≤ 0.5 ppm, O2 ≤ 0.5 ppm). This procedure was repeated at least three times. The furnace was heated up to 1873 K at a rate of 2 K/min. The samples were then lowered down slowly from the quenching chamber to the reaction zone. The samples were kept at this temperature for 6 h before being cooled down at a rate of 2 K/min to the targeted temperature of either 1573 or 1773 K, and kept there for 48 h. Finally, the samples were quenched in the cooling chamber. Throughout the tests, Ar gas was flushed through the chamber at a rate of 0.1 ln/min. Slag samples were prepared for SEM–EDS analysis. The phase fractions were estimated using a Leica DM4500 P instrument equipped with Leica LAS and QWin image analysis software. These measurements were accumulated over multiple images covering most of the sample surface. In Eq. (1), w O and w i are the outgoing and incoming hot metal weights; %V o and %V i are the outgoing and incoming V concentrations in the hot metal. The calculated values of the V yields are included in Table 4. The final V slag compositions for the 9 BOF tests are shown in Table 5. V3+ and V4+ are reported to be dominant at low oxygen partial pressure and low basicity in metallurgical slags [18, 19]. In order to present the results, V2O3 is used to describe the compositions of both liquid and solid phases. Note that the focus of the present study is not to identify the fractions of different cations. The relatively high CaO content in sample BOF2 is due to high slag entrainment from the EAF. The BOF slag samples 1, 2, 4, and 5 have high P2O5 and FeO contents in addition to a high residual V content in the final hot metal. These samples have been produced according to the conventional processing method and will be discussed later. BOF samples 3 and 6 to 9, obtained by the developed extraction method, have an overall composition similar to the one targeted for the phase relation study. As mentioned earlier, to gain a better understanding of the temperature effect on the extraction process, the phase relationships at 1573 and 1773 K are experimentally studied. Totally, three phases are found in the equilibrated samples in the laboratory experiments, viz., (1) spinel phase named as SP, (2) free SiO2 named as SiO2, and (3) a matrix consisting of silicate phases. In addition to these phases, (4) metal droplets named M were found in the BOF samples. The absence of concentration gradients in the SP grains and their large size confirm the existence of SP at the temperatures studied, which has also been discussed more thoroughly in a previous study . It has been reported  that the matrix [phase (3)] is liquid at the experimental temperature. The liquid has decomposed into fayalite (Fe2SiO4) and augite [Ca(Fe, Mn)(Si, Al)2O6] phases during cooling, because of insufficient quenching . The matrix will hereinafter be named the liquid phase (L). Figure 3 shows examples of the spinel–liquid two-phase mixtures in the samples obtained at 1573 and 1773 K, respectively, in the laboratory study. Similarly, these three phases are also the only phases identified in the industrially obtained samples in addition to M. Figure 4 presents an example of the coexistence of the three phases, L, SP, and SiO2 in a sample obtained from the BOF. The phases found as well as the average compositions (over four measured values) of SP are presented in Table 6 for both laboratory- and industrial-scale samples. Normalization was performed by taking the sum of the components as 100 mass%. Note that a small amount of molybdenum oxide is detected in the laboratory samples, due to the use of Mo crucible. The impact of Mo on the investigated system has been discussed previously . It is concluded that the presence of Mo in the slag would have little effect on the phase relationship between L and SP, since the content of Mo in the liquid is low. Hence, in the later discussion, normalization of samples L1 to L3 and H1 to H3 was performed by excluding Mo. The composition of L was analyzed with area scan at 600 times magnification. The average compositions (taken over four measured values) of L for sample L1 to L3 and H1 to H3 are presented in Table 7. SiO2 was found in BOF samples 6 to 9 all having an Al2O3 content of less than 0.4 mass% and CaO content of between 0.3 and 1.2 mass%. This finding is in accordance with the laboratory study at 1573 and 1773 K, and earlier laboratory results at 1673 K , where SiO2 is found in samples with a weighed-in composition of 0 mass% Al2O3 and 1 mass% CaO. The effects of temperatures 1573 and 1773 K on the phase composition were investigated for three different weighed-in compositions (samples L and H), in addition to the data from the previous study at 1673 K . The contents of the components in L and SP as a function of the temperature are shown in Figs. 5, 6, and 7. The L and SP for samples with weighed-in compositions of 0 mass% Al2O3 and 1 mass% CaO are shown in Fig. 5a and b, respectively; for samples with 5 mass% Al2O3 and 1 mass% CaO in Fig. 6a and b, respectively; and for samples with 5 mass% Al2O3 and 5 mass% CaO in Fig. 7a and b, respectively. The bars represent the standard deviation of the four measurements for each sample. The MnO, SiO2, and V2O3 contents were fixed at 5.5, 17.0, and 30 mass% (20.4 mass% V), respectively. In the investigated concentration range, the concentrations of FeO, MnO, and V2O3 in SP are almost the same. The only apparent difference is a small dilution effect of V2O3 in SP for samples with a weighed-in Al2O3 content of 5 mass%. The impact of temperature on the phase composition is relatively small; however, in all cases, there seems to be a tendency that V2O3 is increasing and FeO is decreasing in SP with the increasing temperature. where A sp is the area of SP, A tot the total area, and A p is the area of the pores. The temperature has no clear effect on the phase relations. No visual impact on the phase fraction can be observed with varying weighed-in Al2O3 and CaO contents. This has been explained in an earlier study by the fact that a large part of the Al2O3 and all CaO substitute FeO in the liquid . As the samples are balanced with FeO, increased weighed-in contents of Al2O3 and CaO lead to an almost corresponding reduction of the FeO content in the liquid. The results show that the liquidus temperature of V slag with 20.4 mass% V is higher than 1773 K due to the presence of SP at 1773 K. This can be compared with the study by Fang et al. who investigated FeO–SiO2-based slags with 8.5 mass% V and found that spinel crystals begin to form at 1699 K . Zhang et al. concluded that V extraction is mainly affected by, besides the chemical potential of V, the melting point or the fluidity of the slag . Solids have in general much higher impact on viscosity than minor alteration of, for instance, the slag composition . In the present study, the effect of temperature on the phase fraction of SP in the solid–liquid mixture is negligible in the temperature range of 1573–1773 K. The temperatures within this range could therefore be expected to have a relatively small impact on the slag fluidity and thereby the V extraction. The hot metal temperature at tap should therefore be targeted to maximum 1673 K as it is also well known that C retention is promoted by low process temperature [16, 22]. C retention is important from the perspective of upholding a low liquidus temperature of the metal , lower consumption of solid coolants in the V-extraction process, and higher scrap ratio when/if converted to steel in a second converter. Tests BOF1, BOF2, BOF4, and BOF5 simulated the conventional method for processing V-bearing hot metal in BOF , with the difference being that only iron ore pellets were used as coolant due to the shorter melting time , stronger cooling effect, and its positive impact on the FeO activity . In tests BOF4 and BOF5, more coolants, pellets, were used compared with BOF1 and BOF2 as the air was oxygen enriched to 50 vol%. This is because N2 acts as coolant as well as low O2 concentration prolongs the blowing time, resulting in higher heat losses. The measured O2 flow through the lance, metal temperature, and the calculated decarburization rate (deC) and C content, both measured and calculated, are presented in Fig. 9a as an example of the conventional processing method applied for V-rich hot metal (sample BOF2). The metal temperature is presented as a “constant” value until the next measurement. The deC and the C content in the metal were calculated based on the measured off-gas composition and gas flow. In accordance with the study by Huang et al. who investigated hot metal processing (0.3 mass% V) with 100% iron ore pellets using a 70-ton industrial converter , the temperature decreases during the initial stage of the blowing as the melting rate of the pellets are fast. The temperature of the metal is then gradually increased, and the blow in test BOF2 is terminated at 1655 K. It has been suggested that the blowing temperature should be controlled to be less than 1653 K at the blowing endpoint to attain the lowest possible residual V content in the metal . The residual V contents in both BOF1 and BOF2 were higher than 1 mass% in the metal (see, Table 4). More coolants are therefore needed in order to increase the extraction ratio without exceeding an end temperature of 1655 K and consequently, the blowing time needs then to be extended, which would have a negative impact on the productivity. For this reason, BOF4 and BOF5 were conducted with oxygen-enriched air and larger amount of iron ore coolant. However, oxygen blowing in these two tests was terminated already after 6 min as an end temperature of over 1655 K had been obtained. The FeO contents in these four tests were high thereby indicating poor mixing condition between top slag and the metal bath. It was therefore realized that the conventional method could not be applied for hot metal with 2 mass% V or more as the bottom-blown N2 gas and the formed CO gas were not sufficient to realize good stirring conditions. This is probably mainly related to the higher consumption rate of coolants per ton of hot metal at higher V concentrations in the melt. The philosophy in the remaining tests was therefore to maximize stirring by creating higher momentary flow rate of CO(g) by permitting shorter treatment periods at temperature higher than 1655 K. In this way, ideal conditions for dissolving the iron ore coolant were obtained. Figure 9b presents the experimental results of trial BOF9 as an example for the proposed extraction method for V-rich hot metal. Sharp increases of deC and metal temperature are observed after about 6.5 min. The deC rate reaches its maximum of about 21 kg C/min at 7 min. Thereafter, it starts to decrease. At that point of time (t8 min), the oxygen gas supply is stopped. It is worthwhile to mention that if all O2 reacts with C dissolved in the metal bath, it corresponds to a deC of 9.1 kg C/min. As the residual V and Mn contents in the metal are low, it is reasonable to assume that the high deC is mainly related to reduction of iron oxides in the top slag. By integrating the decarburization curve between t6.5 and t10 min and by deducting the maximum amount of C that could be removed by O2 (9.1 kg C/min between t6.5 and t8 min), the minimum amount of C oxidized by iron oxide can be evaluated. This simplified approach shows that a minimum 32 kg of C in the metal bath is oxidized by iron oxides. This corresponds to 142 kg of Fe2O3 or 191 kg FeO. In addition, iron oxides are also consumed for oxidation of primary V, Mn, and Cr in the metal. It can therefore be concluded that melting rate of pellets is not sufficiently fast at high consumption rates. Using pure oxygen instead of oxygen-enriched air with 50 vol% O2 would likely lead to the hypothesis that even less amount of pellets would be dissolved during the initial period. A method using high momentary deC is therefore proposed to promote oxidation of V in the metal bath with iron oxides in the top slag. The iron oxide coolant is however added targeting an end temperature of 1677 K or below. About 1 mass% of C in the metal bath is lost. This is in the same range as for the conventional processing method treating hot metal with 0.3 mass% V [3, 4, 6]. It should be added that no build-ups in the mouth of the BOF or scull formation on the water-cooled lance was observed throughout the test campaign. In metallurgical processes with the variation of oxygen potential, V is transferred between slag and metal. For the convenience of technical consideration, the distribution coefficient (also known as partition coefficient) defined in Eq. (3) is very often used. The parentheses are used to designate a concentration in the slag phase (in mass%); and the square brackets are used for a concentration in the metal phase (in mass%). The distribution coefficient for V (L V) has been determined in a number of experimental studies [16, 17, 18, 24, 25, 26]. The studies by Inoue et al. and Selin [25, 26] were performed for MgO-saturated slags and thus outside the normal production range for V slag. The study by Howard et al. was performed at 1873 K which is considerably higher than the scope of the present study. Werme  investigated the effect of Lv with the addition of oxides like CaO, Na2O, MgO, Al2O3, and TiO2 at 1573 K. Zhang et al. studied the influencing factors, such as temperature, slag composition, and slag-to-metal ratio on Lv between hot metal and FeO–SiO2–MnO (–TiO2) slag . The Lv dependencies on SiO2 and temperature obtained in the present study are shown in Fig. 10a and b, respectively. The results obtained by Werme  and Zhang et al. are also included in the figures for comparison. Samples BOF3 and BOF6-9 are in the compositional range of 5–6 mass% MnO, 0–0.3 mass% Al2O3, 0.3–2.2 mass% CaO, 2–4 mass% MgO, 17–20 mass% V, and 2–6 mass% TiO2. It should be pointed out that the main V concentration range in the slag in the study by Werme  and Zhang et al. is 1–2 mass%. In line with the previous studies [16, 17], LV decreases with both the increasing SiO2 content and temperature. SiO2 is known to decrease the FeO activity in FeO–SiO2 slags , and therefore it is likely that the decreasing Lv with the increasing SiO2 content is a result of decreasing FeO activity. No significant impact on LV is however found in the temperature range of 1701–1725 K with SiO2 fixed at about 17 mass%. This could be an indication of that the slag composition has a larger impact on L V than the temperature in the investigated compositional and temperature ranges. In the phase relationship study, the composition of L showed very little dependence on temperature and could help to explain this statement. Very little information is available for the P distribution coefficient (L P) within the normal production range for V slag . In the present study, L P ranges between 0.13 and 0.26 in tests BOF3 and BOF6-9 and between 0.54 and 1.41 in tests BOF1-2 and BOF4-5. Poor stirring conditions (BOF1-2 and BOF4-5) thus seem to result in both higher Fe and P contents in the slag. The relatively high P content in these V slags could prevent their use for production of FeV for the steel industry. P is found to distribute into the augite phase in the BOF samples formed under these less-favorable process conditions. The average compositions of the augite [9, 20] and fayalite [9, 20] phases in these samples are presented in Table 8. Normalization was performed by taking the sum of the components as 100 mass%. The low CaO content in fayalite is likely the reason that no P was detected in this phase. It has also been shown that these silicate phases have precipitated from a liquid phase during cooling. The impinging jet of oxygen that penetrates into the metal bath forms soluble oxygen which violently reacts with the elements in the bath, foremost C, Cr, Fe, Mn, Si, Ti, and V . It is therefore reasonable to assume that P is also oxidized and is dissolved in the liquid phase. P-oxide is generally not stable in acid slags and could therefore easily be reduced back to the bath in a well-stirred reactor. A large reaction area of the metal–slag interface seems therefore to be important when targeting for low P content in the final V slag. A V-extraction method was developed using a semi-industrial-scale BOF. The hot metal studied contained about 2 mass% V, 0.1 mass% P, 0.4 mass% Si, and 0.3 mass% Mn. Up to 70 kg of top charged iron ore pellets per ton hot metal could be dissolved in the slag in combination with a gas penetrating jet of oxygen-enriched air with 50 vol% O2. The complete dissolution of pellets was achieved by deliberately creating good stirring conditions utilizing CO gas formation. High momentary decarburization rates at temperatures over 1723 K still resulted in reasonable C retention in the metal. The temperature could be controlled to around 1677 K at the blowing endpoint when the iron ore coolant had been dissolved. The V slags produced in the temperature range of between 1677 and 1763 K contained as high as 20 mass% as V and were found to be solid–liquid mixtures consisting of either spinel (SP) and liquid (L) or SP, L and free silica (SiO2). Up to 94% V yield to the slag was achieved. The P distribution to the slag was low when good stirring was maintained. The impact of SiO2 on the FeO activity in the slag on the V distribution seems to be more important than the temperature in the investigated range of 14.5–21.1 mass% SiO2 and 1677–1763 K.
The impact of temperatures ranging between 1573 and 1773 K on the phase relations and phase compositions were investigated experimentally in laboratory scale for V slag with 20.4 mass% V. The composition of L showed very little dependence on temperature and could partly explain the fact that the slag composition seems to have a more profound impact than temperature on the V-extraction process. SiO2 was found in samples with a composition of less than 1 mass% Al2O3, less than 1.2 mass% CaO, and in the range of 14.5–21.1 mass% SiO2, in both semi-industrial- and laboratory-scale samples. Addition of 5 mass% Al2O3 or 2.2 mass% CaO was sufficient to prevent the presence of SiO2 in samples with 17 mass% SiO2. Funding from Mustavaaran Kaivos Oy and ERA-MIN, the ERA-NET program on the Industrial Handling of Raw Materials for European industries and supported by the European Commission’s 7th Framework Program, via VINNOVA, Sweden’s innovation agency, are gratefully acknowledged. Special thanks to Jukka Pitkäjärvi and Kyösti Heinänen of Mustavaaran Kaivos Oy for their support.